RICHLAND - Several Richland area residents have voiced their concern after female students were pulled out of class to view a presentation about the dress code. Several people wrote on the KOMU 8 News Facebook page explaining that the principal only spoke with the female students in seventh through 12th grades. The superintendent chose not to comment but did say the presentation for female students was to clarify questions about the dress code. He also said the school will release a statement sometime this week. 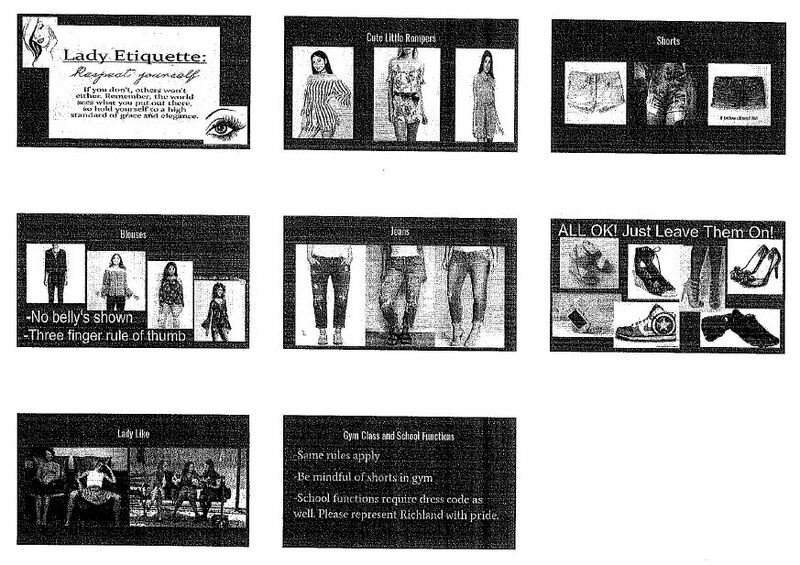 The presentation was titled Lady Etiquette, and included seven slides. The first slide included a quote which read, "Respect yourself. If you don't, others won't either. Remember, the world sees what you put out there, so hold yourself to a high standard of grace and elegance." Mona Smith is a Richland area resident who has two daughters in the school district. Mona Smith said both of her daughters viewed the presentation. She said one of her daughters said they only discussed the dress code with the girls because they did not want the girls' clothing to distract the boys. Mona Smith said the boys and girls need to be treated as equals. "It probably belittled them," said Mona Smith. The district provided KOMU 8 News with a printout of the presentation slides. Terri Smith, not related to Mona Smith, is the mother of two boys who attend school in Richland. She said her sons did not feel it was fair for the girls to be the only ones the school talked to about the dress code. One of Terri Smith's sons said the girls were talked to because their outfits were distracting the boys. She said there are many more issues the school should be addressing, such as bullying. "Everything needs to be addressed. Everything. Not just this," she said. Both women said this was the first time they had heard of female students being singled out for something. "Individual students have been singled out a lot," Terri Smith said. The school sent out a statement that said the presentation was a dress code clarification meeting. The statement also said the meeting was to address questions from female students about the dress code.